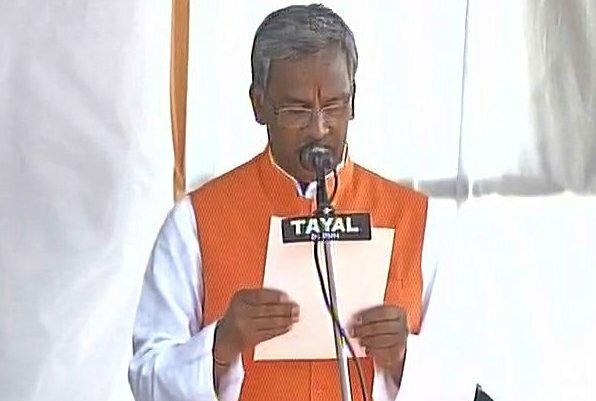 Long-time RSS Pracharak Trivendra Singh Rawat was sworn in as new Chief Minister of Uttarakhand on Saturday. The swearing-in ceremony took place today at 3 pm at Parade Grounds in Dehradun. Prime Minister Narendra Modi and BJP President Amit Shah attended the swearing-in ceremony. Reportedly, a total of nine ministers took oath, including seven Cabinet Ministers and two Ministers of State. Satpal Maharaj, Harak Singh Rawat, Madan Kaushik, Arvind Pandey, Subodh Uniyal, Yashpal Arya & Prakash Pant made Cabinet Ministers whereas Rekha Arya and Dhan Singh Rawat took oath as Ministers of State. Earlier on Friday, the BJP legislature party unanimously elected Rawat as its leader following which he met Governor K.K. Paul and claimed support of 57 party legislators.